The tiny batteries buried in AirPods start to wear out in a few years. Apple’s second-generation AirPods are arriving just in time for people who are discovering that their first-gen ones are wearing out. This despite the original AirPods being, at most, 2.25 years old. But this doesn’t appear to be a nefarious scheme by Apple. It’s unescapable when you’re dealing with lithium-ion batteries. These come with a limited number of uses, by their very nature. And over many recharges, the amount of juice each battery can hold drops. The same type of thing happens with iPhones, Androids, laptops and any other product with a li-ion battery. But batteries can be swapped out on many products, extending the life of the device. That’s probably not something you should try on your own with AirPods, though. 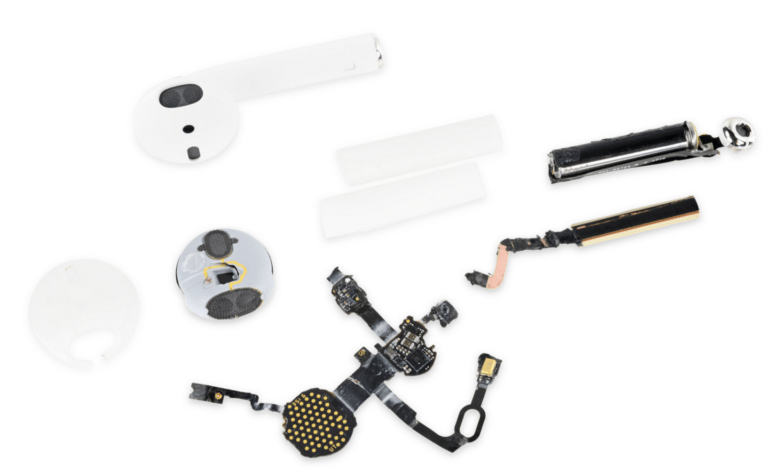 In its teardown of Apple’s wireless earbuds, iFixit found that replacing the battery inside is really not practical for DIYers. “Hidden behind and within the torrent of glue, we spy the end of the battery cable. Ripping out the glue plug reveals the end of a teensy weensy battery, with teensy weensy spot welds. Looks like we won’t be replacing these any time soon (or recycling them, ever),” the company wrote. Kyle Wiens, the founder of iFixit, has been highly critical of Apple in the past for making products that can’t be easily serviced. Time to move up to second-gen AirPods? Anyone who put down $159 on a pair of AirPods is likely to be irritated at discovering the wireless headphones only have a two-to-three-year lifespan. Still, second-gen AirPods bring some new features, including hands-free “Hey Siri” and better battery life (at least when it comes to talk time). That should equal a dramatic increase for anyone with earbuds currently suffering degraded battery life after a couple years of heavy use. Our Ian Fuchs already ordered a pair.